Hormel Chili with Beans is made with 100% USDA beef and beans. It is fully cooked, so just heat and serve! 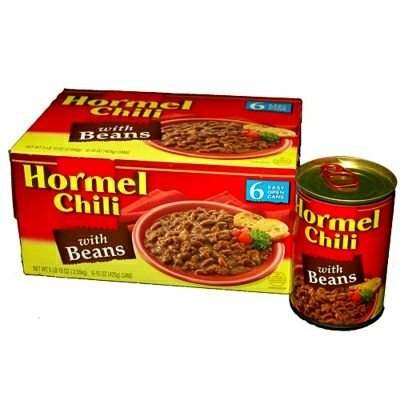 Hormel Chili is made with choice ingredients, blended and simmered slowly in an open kettle to bring out their full flavor and aroma. The result is a rich and hearty flavor chili lovers ask for-perfect for eating right in the bowl and spicing up your favorite recipes, too.6 cans15oz. eachLabeled for resaleGluten freePull tab lids100% USDA beef & beansFully cookedHeat and ServeIngredients: water, beef, beans, concentrated crushed tomatoes, corn, flour, salt, modified cornstarch, chili powder (chili peppers, flavoring), flavoring, sugar, spices, green chilies (contains citric acid) onions, jalapeno peppers (contains vinegar). If you have any questions about this product by Hormel, contact us by completing and submitting the form below. If you are looking for a specif part number, please include it with your message.